Saturday evening Grand Funk Railroad brought the time machine with them and smoothly transported the crowd into the 1970s. These days the band is led by founding members drummer Don Brewer and bassist Mel Schacher. Joining them were Max Carl on lead vocals and guitar, lead guitarist Bruce Kulick from Kiss fame and keyboardist Timothy Cashion. The near capacity crowd were taken for a ride on the “Locomotion” early on in the set. The band sounded very tight and delivered a groove that had the crowd actually jumpin in the aisles. Another highlight was the song “Second Chance”, co-written and recorded by Carl when he was a member of 38 Special. To this day that song holds the distinction of being the highest charting song in the 38 Special catalog peaking at #6 on the Billboard charts. 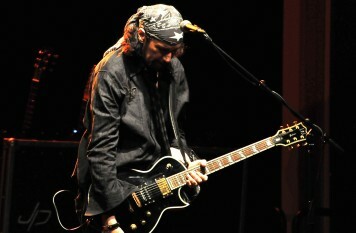 Former Kiss Guitarist Kulick has now been playing for Grand Funk since 2001. He brings solid musicianship into the band and was given the spotlight for a stirring rendition of “The Star Spangled Banner”. “Some Kind Of Wonderful” livened up the place as Brewer started the song from the front of the stage and ran behind the kit to finish it. Then it was time for the defining song in the band’s catalog “I’m Your Captain (Closer To Home). The epic track clocking in at over ten minutes long closed out the show in fine fashion. Co-founder Don Brewer has had quite a career. Not only was he the drummer, he also co-wrote and sang lead on some songs, most notably on the encore “We’re An American Band”. Brewer also has been a touring member for Bob Seger and The Silver Bullet Band for several years as well. As the crowd exited the venue, one could not help but think that they just have seen one of the best band’s from the 70’s even if the line-up wasn’t the same one from their heyday.